I am a bit excited about this! It's almost perfect – except for the size – and I am in Australia!! Will have to do a bit more reading… Thanks so much for the info! 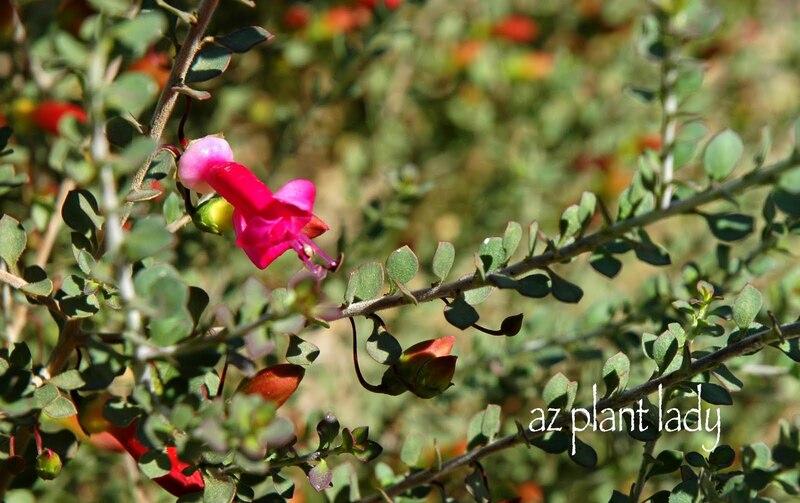 I love this pretty shrub also-to think it blooms that long and it's low maintenance. Doesn't sound like though it would be good for Michigan. But beautiful anyway. Gorgeous! I love the photo too when it is not in bloom…stunning just as foliage…fantastic! That is AWESOME! How gorgeous! I wonder how it would do with Houston's humidity? 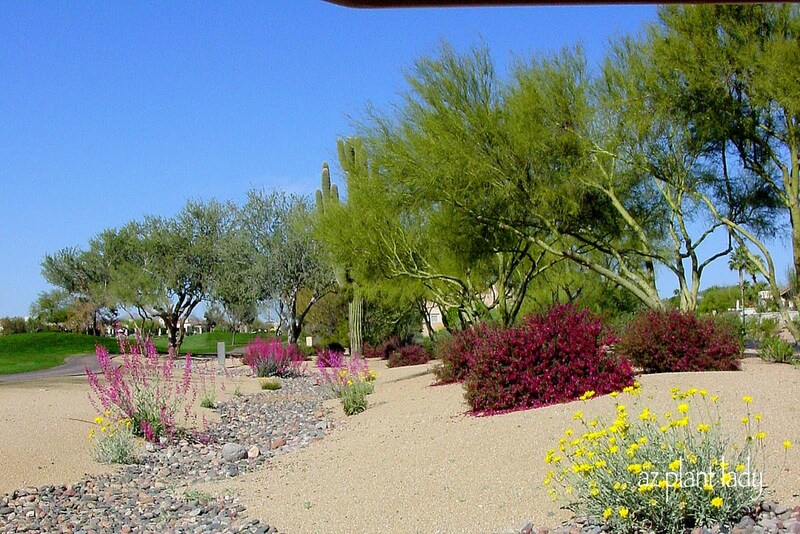 Oh, I didnt' know that the desert has such luscious bushes and brightly coloured flowers. It beautifies the landscape. I can see why it is your favorite! I love the name as well. It even looks good when not in bloom, a definite plus! I love coming here to see what is beautiful in other parts of our country. Each region has beauty of it's own.This color is wonderful. Magnificent Australian native! The color is sublime, I agree!! Wish I had room for one. It's most beautiful! Thank you for introducing us to the desert beauties! The landscape area that you designed is has a wonderful combination of colours. I've never seen valentines before…not even on the World Wide Web! This post came at the perfect time. I'm really starting to jones for winter color. You'll have to show us those marroon tips later! Noelle, a beautiful design! I love a dry creek and the visual you have created. I try to explore some – to me- new blogs that deserve an award. Wow Noelle, what a nice plant. I will do some more research on this one!! From your title I was guessing something red . . . and I was right! With hardiness to just 15 degrees, I won't be adding it to my cold-winter garden. But it was great to read about your favorite shrub. Gotta love something that actually LIKES reflected heat, wow. 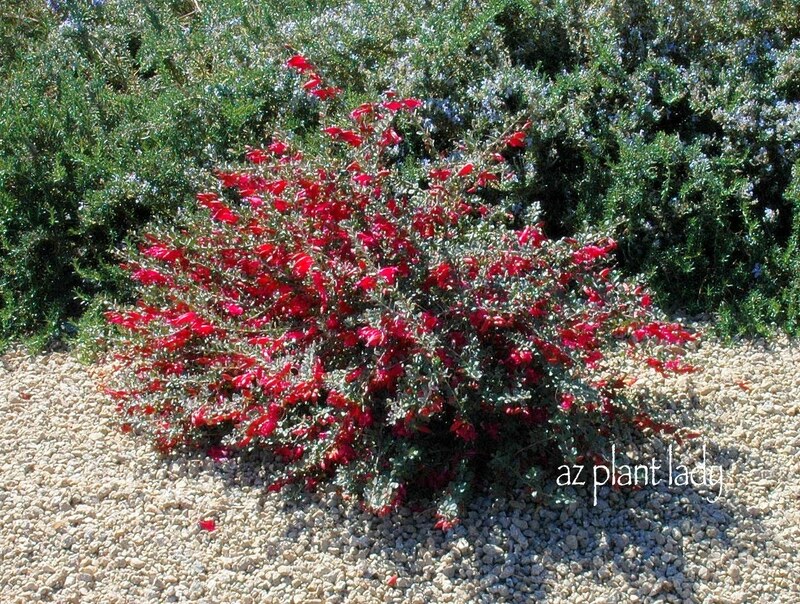 These are just gorgeous shrubs. I can imagine the hummingbirds must go crazy for them. They look so pretty with the other combinations of plants and trees. Oh my gosh, Noelle you crack me up! I was halfway through reading and thought, "wow, I bet a bunch of people in her neighborhood shear this poor thing into frisbees and lolipops". then… "Oh. ok" Thanks for sharing this Aussie lovely! Love that shrub. Fantastic!! That shade of red is a winner! What a great shrub. I love that shade of red in the blossoms. And easy to care for? What more could you ask!! What a beautiful bush. I love the color, it is so enchanting. so pleased you love this plant. I believe it is popularly called emu flower because the flower looks a bit like an emu. I love the planting you did with the sandy soil in between. but personally I have difficulty with red and have little or no red in my garden. But I guess against the sand bright colours like red are good, and pastels like i am into probably look faded in the bright sunlight. 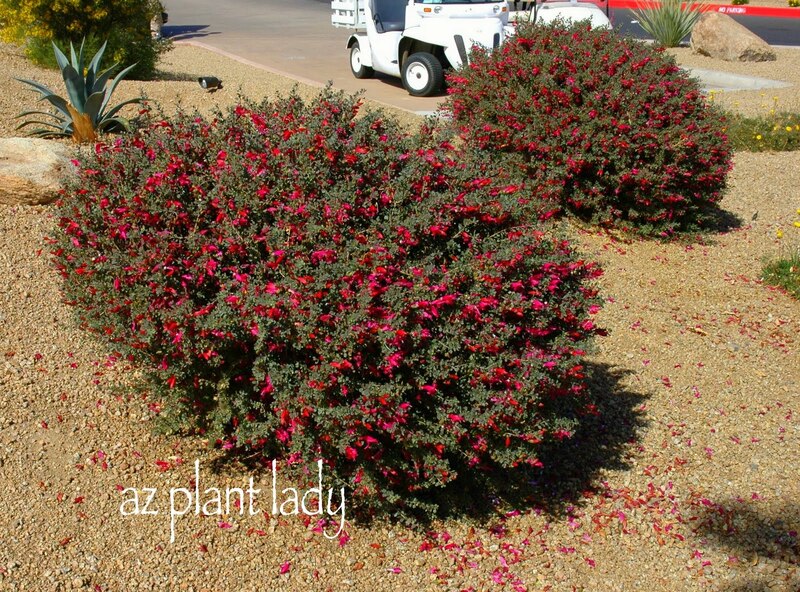 Thank you all for your overwhelming response to my Valentine shrub. I am glad you like it as much as I do. Sarah, I am so glad you are getting some for your nursery. Please let me know what you think. Carol, thank you for the compliment. We use negative space often in desert landscaping. It actually highlights the natural shapes of the plants. Evelyn, I hope you are able to find this one in Australia. If not, a closely related one is Eremophila brevifolia. Alice, if you ever find some room, please try one, I think you will love it. Kanak, I always enjoy the beautiful plants that you showcase from your part of the world. Catherine, I do see hummingbirds around them. Bjorg Nina, thank you for visiting for the first time. I will be visiting your blog soon. Hi Noelle, I've been seeing your "name" around and decided to visit you. As I was reading about Valentine, I thought, nice but probably not hardy where I live [Zone 8, Pacific Northwest]. But I can do 15 degrees, heck yeah! Outstanding plant in and out of bloom. Gimme, gimme! Your design is fabulous. They look so lovely, Im sure that I wouldn't even waste the branches when shearing and replant them all over again. Can these grow in the tropical climate or they can only survive in the desert? That first bloom is very pretty! Fuchsia color. Thank you for the compliment. Our coldest temperatures reach in the high teens for a couple of nights a year. I haven't had problems with frost damage, but maybe with multiple low temps in the teens, they might. But, maybe the bottom growth would survive. I know it grows in Texas, which is somewhat more humid then we are. I think you won't know if it will grow unless you try it. 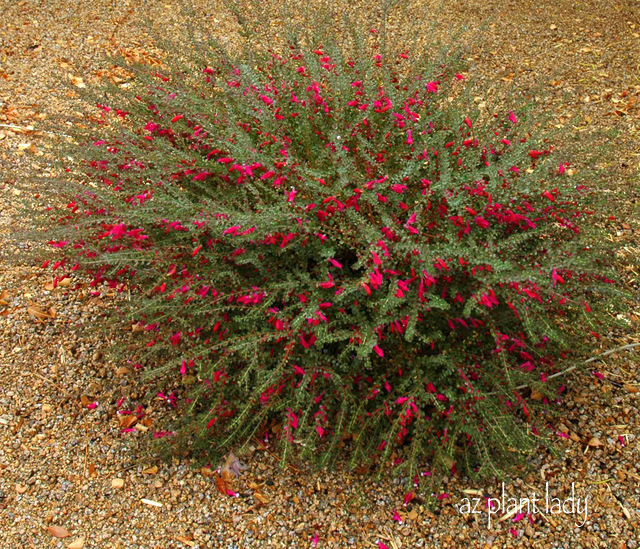 I don't think the 'Valentine' variety is available internationally, but you can try Eremophila brevifolia which may be. Never heard of this shrub before. I like the bush itself more than when in bloom. To me all that red is the desert during winter just does not seem right. Then again I'm also not a fan of Knock out roses or those encore azaleas. Like Grace this was my first visit here, I'll be back. Thank you! just what I’ve been looking for! 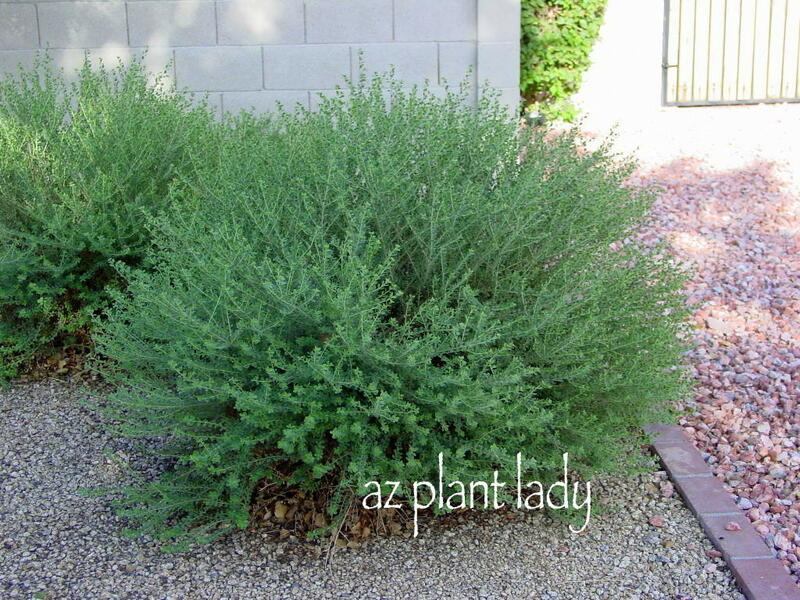 Can I plant Desert Marigold and Parry’s Penstemon now in my garden? I’m looking for color until my spring flowers bloom. Thank you for sharing the “growth” of your Valentines. I agree they need some negative space to fully display their glorious color. How lovely to see color in the Winter, especially for our resident hummers! Do Valentine bushes attract bees? I’d like to plant near my pool but prefer NOT to attract bees there. I’ve googled and cannot find the answer!